Germany has a much wider (and better-priced) selection of merchandise than Denmark. So, a few times a year, I drive to the German border town of Flensburg to stock up on supplies. Until now, I’ve only gone to the giant shopping complex off the highway, but this time, I brought the photographer with me, and he took me downtown. Have a wonderful New Years Sage…and Opie too! Is Denmark expensive compared to other EU countries? I always find France expensive compared to Canada… but again, Canada is more expensive than the US for some stuff, so we drive south for bargains once in a while. I just squandered far too much of my day reading your blog. It was very interesting to revisit the newness of being in Denmark, and the perspective of being single, as opposed to married to a Danish man. I’ve been here going on 10 years (god, it’s frightening to write that out loud! ), in midwest Jutland. I gather you’re in southern Jutland somewhere. Anyway, thanks for the enjoyable blog and lovely photos! 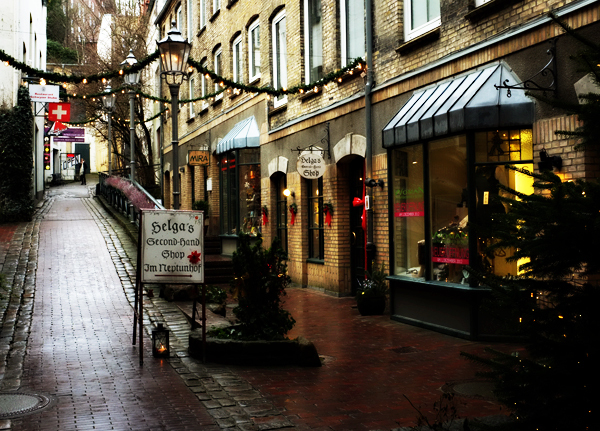 We did our first real foray into downtown Flensburg in early December (well, we visited the cathedral area near the Gallerie Mall downtown in November too) and I was quite pleasantly surprised by the harbor area and our walk down the main shopping street and up and down some of the smaller alleyways. Such a nice little destination. I have heard really good things about Lubeck a bit further south and am anxious to visit there, perhaps later this year. Zhu: We have the highest VAT in Europe (25%) and based on my experience traveling in so called “expensive” cities like London, Rome, Venice, and Amsterdam, I still find prices to be higher here in the Danish countryside than in all of those places. The only place I’ve been that’s been more expensive was Norway.